Arenberg-Nordkirchen are small riding horses from north-west Germany. 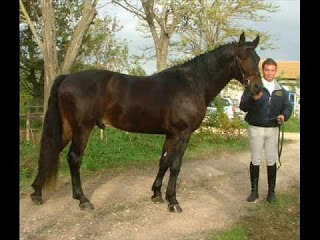 They can be black, chestnut, bay, or gray, and are used for sport/hobby horses (general riding and jumping). Germany does not have a long tradition of small horse breeding; the only native small horse is the Dülmener. From the early twentieth century ponies and small horses were imported, mostly from Great Britain, and some private individuals started breeding from them. Arenberg-Nordkirchen horses were started in 1923 by the then Duke of Arenberg as a semi-feral herd on his estates in Nordkirchen, near Münster in Westphalia. They were based on Dülmener horses, from which he intended to create a small and elegant riding horse. His stock was small, with no more than about 40 mares. In 1968 the entire herd was sold to a breeder from Nordkirchen, who introduced other pony and small horse blood to improve its riding-horse qualities. In the 1980s the herd was broken up, and the horses sold in Schleswig-Holstein and North Rhine-Westphalia, where they became part of the regional German Riding Pony populations. Arenberg-Nordkirchen horses were seen at the Berlin International Green Week in 1984, after which it was thought that they were extinct. In 1995 a small number of surviving animals were found. Since 1999 the known population has remained stable at about 20–25 head. In 2007 there were four stallions and eighteen mares.